I stumbled upon this retro green and polka-dot fabric at the thrift store. Something about it caught my eye even though it was polyester and very bright. 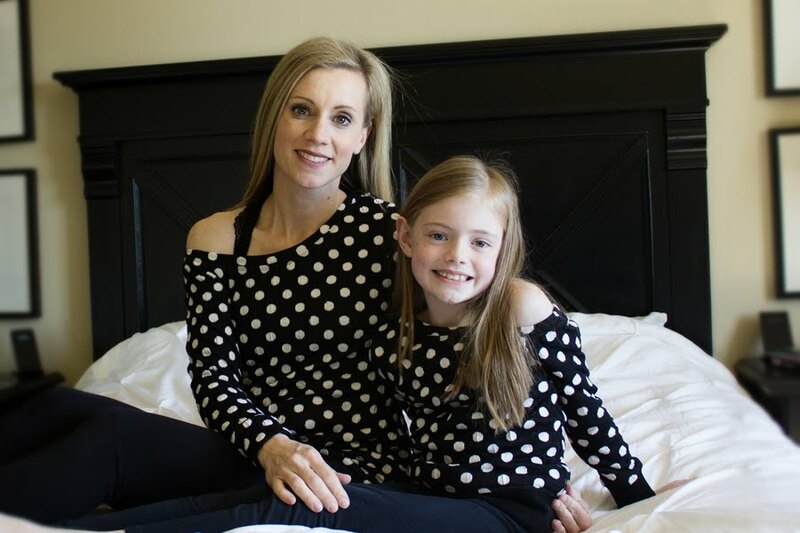 I picked up several yards of it for a few bucks and decided to make a couple dresses, one for me (tutorial coming soon) and one for my daughter. I was searching for an A-line style dress with a retro feel. 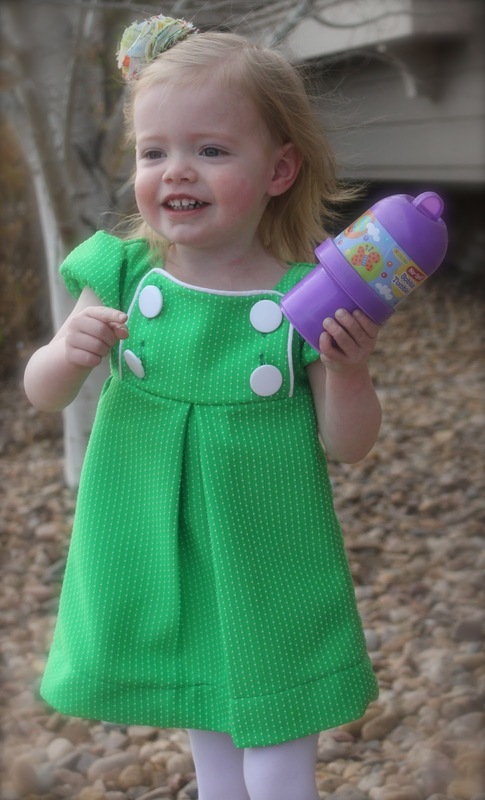 I came across Jess at Craftiness is not Optional's sew along for her Junebug Dress. I created this dress for my daughter with a few alterations to the pattern. 1. When creating the bodice flap I added piping. I began by pinning the piping on to the right side of the flap and basting it in place. Make sure you cut slits in the piping at each corner to help it turn. After basting the piping, I pinned the lining to the right side of the flap and stitched it closed (sides and top only) per Jess' tutorial. Then flip the piece right side out and press. 2. I only had enough room for 2 buttons instead of 3 because the ones I had on hand were so large, so I modified the pattern by only making 2 buttonholes on each side of the flap. 3. I wanted a pleat in the front and back of the skirt instead of gathering it. I went for a pleat because of this fabric's bulkiness. When gathered it creates a very full effect. I wanted the fabric to lay down flat in a more defined A-line so I went with pleats instead. First, I took my skirt piece and measured across to find the center of the front and back. I marked it with a pin and then measured 2 inches out from each side of the center pin and marked those two spots. Next take each outside pin and fold it in towards the center pin and then back on itself to create a pleat. Do the same for the opposite side so that it looks like this when finished. Baste the pleat and iron it down flat. Make sure you press the pleat a good ways down your skirt to hold it in place. (I didn't do the best job of this and you can see that in the photos). Then create the same pleat in the center back of the skirt. Then continue to attach the skirt to the bodice per the tutorial. Make sure your pleats are lined up with the center front and center back of the bodice before sewing them together. 4. The only other modification I made was to shorten the dress. I wanted more of a mini dress length so I probably shortened the dress a good 4 inches or so from the pattern measurements. I took a gamble and stitched it before trying it on my daughter- luckily it was not too short. 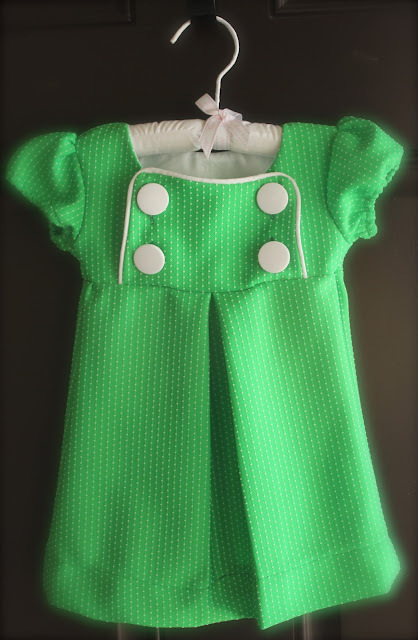 Overall it made for a cute little dress...if only I had made it in time for St. Patrick's Day! there is also an AMAZING elissa hudson print giveaway going on right now as well. This is absolutely adorable! I can tell your daughter really loves it too. Great job! 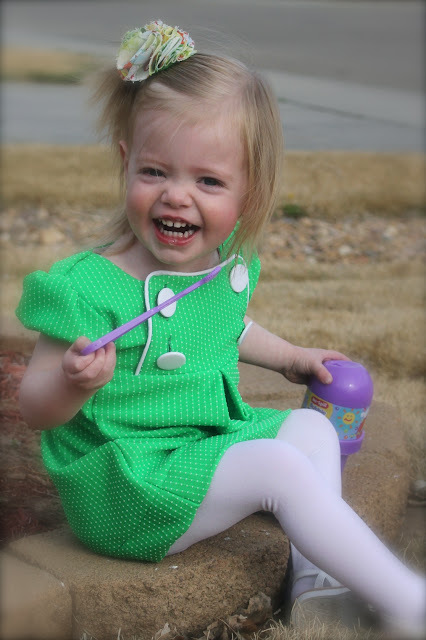 I don't which is cuter, the dress or your little girl! The sewing looks so professional. Wow- thank you! We appreciate you stopping by the blog! Hi, I love your version of the Junebug dress. 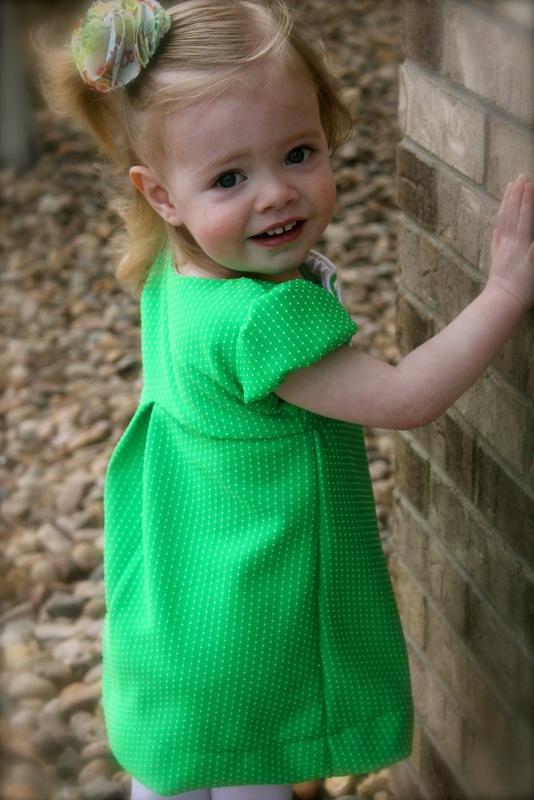 It is on my to do list :) The green fabric looks so beautiful on your little girtl too. the dress is soo adorable! Love the piping on the front and the other changes you made! So glad you came and checked it out- thank you for all your wonderful patterns and tutorials...I have a whole bunch just waiting to be made from your inspiration :) Thanks for all your hard work on the blog!